I was delighted to be voted the winner of the ‘Rare Species’ category in the BSBI’s (Botanical Society of Britain & Ireland’s) 2016 Photographic Competition with a shot of Norwegian Mugwort Artemisia norvegica. It all started around 20 years ago when Anne found a copy of A Colour Guide to Rare Wild Flowers by the late John Fisher in a secondhand bookshop. This is a wonderfully-written little book, illustrated by the author’s own photographs. I understand that after it was published in 1991 the author was ‘hounded out’ of the BSBI for spilling the beans, albeit usually rather vaguely, about the localities of rare plants. How times have changed: the BSBI actively encourages the publication of county ’Rare Plant Registers’, many of which list localities with 8- or even 10-figure grid references. Anyway, Norwegian Mugwort is found on page 322 of Fisher’s book: ‘It is worth a week’s hard labour to see the smiling face of this rarity, gazing like a miniature sunflower across one of the handful (some say two sites only) of sandstone boulders over which it presides.’ With this sentence Norwegian Mugwort became the stuff of dreams, inaccessible in its remote Scottish fastness. 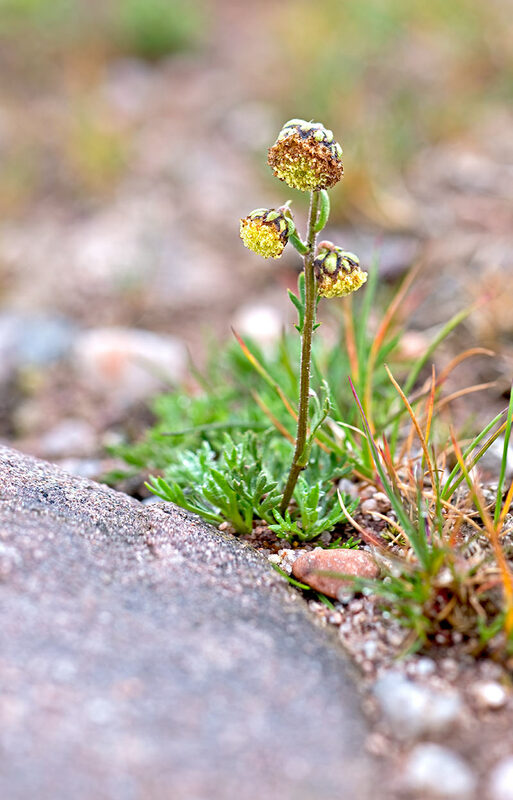 I recent years I have become a bit addicted to mountain flowers, perhaps because of the contrast with Norfolk, and in summer 2016 managed to get away for a while mid-summer for a trip to northern Scotland. I am always a bit nervous in advance of a mountain excursion. Not only are there real hazards (weather, cliffs, scree) and I am typically on my own, but also because according to some of the write-ups that you can find on the web nowadays searching for alpines involves horrendously long walks to impossibly dangerous places. Norwegian Mugwort is closely related to Mugwort A. vulgaris, one of the commonest weeds, but is much, much rarer. 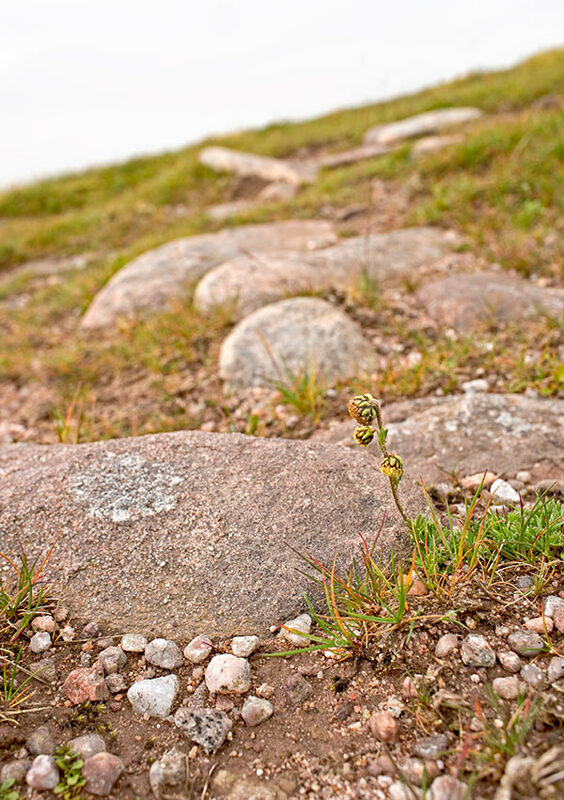 It is only know from three sites in Scotland and from Norway and the northern Urals, and was discovered in Britain as recently as 1950.The best-know site for Norwegian Mugwort is the mountain of Cul Mor, in the Inverpolly region to the north of Ullapool. Cul Mor is 849m high, so not a ‘Munro’, but it sits in splendid isolation and looks pretty special. 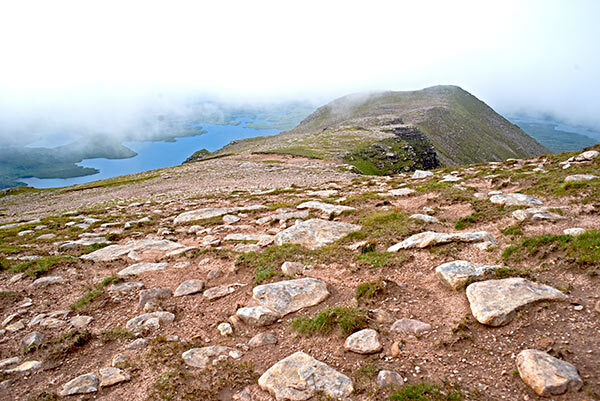 Its geology is special too, as it is largely made up of Torridonian Sandstones deposited around a billion years ago. These sandstones are constantly eroding, and near the summit of Cul Mor I found an area of loose sand that resembled a beach – picking up a handful of sand it was amazing to think that it had first been eroded from long-gone mountains over 1,000,000,000 years ago. I had allowed two days to climb Cul Mor to allow for bad weather – I now think that this was optimistic – but I was lucky. It was amazingly hard to find accommodation in the area, and in the end I booked a room in the dorm at Acheninver Hostel, in a stunning location around 40 minutes drive away down single-track roads. On the first allotted day the cloud base was very low and rain was forecast for most of the day, so I gave up on the mountain and headed to the north coast and fine weather. The second day did not look much better early on, but the forecast was OK so I parked up at Knocken and set off. I could not see the mountain, but the path was obvious, at least for a while. “It’s up there somewhere…” Looking towards Cul Mor and the col to the south from the stony summit of Meallan Diomhain. The first obstacle is the summit of Meallan Diomhain, a rounded, stony hill. It was still misty, but a series of cairns marked the way. From here on however there was no path and it was a matter of ‘yomping’. I could still see neither the summit nor the col to the south that I needed to find, but I ploughed on, optimistic. Fortunately, the mist started to lift from time to time and I could get my bearings, so onwards and up a rather steep slope and eventually the col to the south of the main peak. I did have directions from there, but they were ridiculously complicated and would only work in fine weather, as you had to use islands and mountains many miles away as guides! It was much, much simpler to look for the habitat – flat, very stony areas littered with eroded sandstone boulders – on the steep-sided shoulder of the mountain than projects to the north-west of the summit. Once in the habitat Norwegian Mugwort was common – I think that I saw 250 plants – and contrary to reports a lot were flowering, or at least had flowered but were now going to seed. What’s more, the cloud was now well and truly lifting and the afternoon ended up sunny, calm and warm. 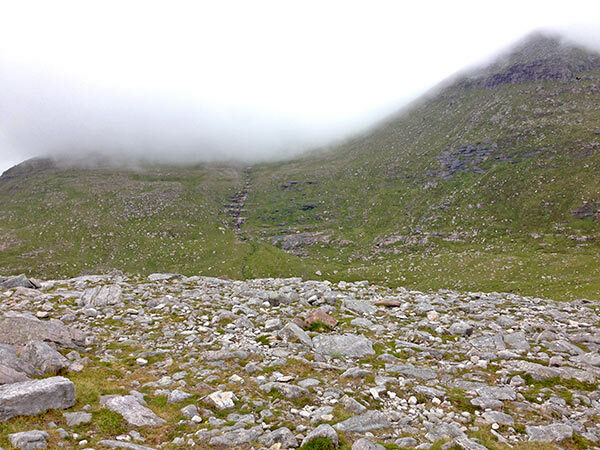 The NW shoulder of Cul Mor as the cloud begins to lift. 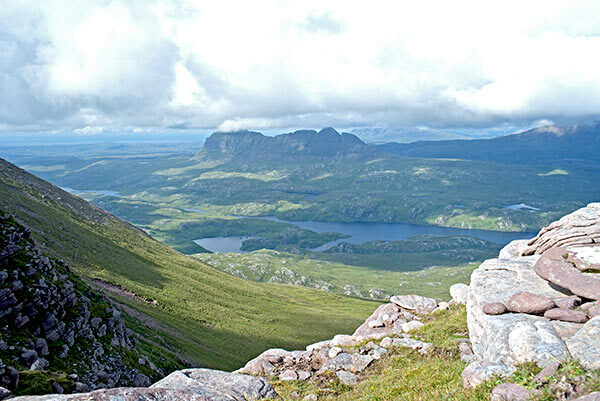 The view from Cul Mor towards Sula Bheinn (Suilven). I spent around four hours wandering around, taking photos of mugworts and a few other alpines, although Cul Mor has a rather limited flora, and just enjoying the place and the view. All too soon it was time to head back down, with more stops for photos. I was back at the car after a ten-and-a-half hour round trip to be greeted by the only midges of the trip. I only saw two people all day, the second a local who told me that this was the first time that the summit had been visible for a fortnight. So, good luck with the weather, a stunning mountain and an intriguing plant: brilliant. I recently read a thought provoking and rather poignant ‘guest blog’ by Lizzie Wilberforce (who I believe works for The Wildlife Trust of South and West Wales) on Mark Avery’s blog (http://markavery.info/blog/). There are a whole range of issues here, but it’s the widespread abandonment of the facts that bothers me, and this is an issue that I will be returning to again and again. To give just one recent example, the latest issue of The Garden (the magazine of the Royal Horticultural Society) celebrates ‘Hosts of golden daffodils bloom again’ (January 2017, p.9). 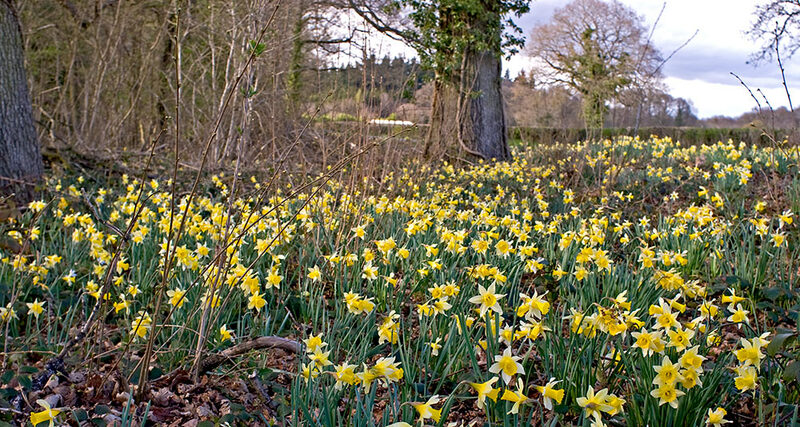 According to the RHS, wild daffodils are now a ‘rare sight’, but help is at hand because 25,000 Narcissus pseudonarcissus subsp. pseudonarcissus and native Bluebells (Hyacinthoides non-scripta) will bloom after being planted at 11 English Heritage properties around the country, including on the Isle of Wight, Warwickshire and Bedfordshire. Apparently this will help secure the future of wild daffodils. There are several problems with this. The first, and most problematic for me, is the statement that wild daffodils are a ‘rare sight’. It is hard to be sure of Narcissus pseudonarcissus subsp. pseudonarcissus’s native range in Britain, as daffodils are so commonly planted (or thrown out by gardeners, ending up on road verges or woodland edges – just about anywhere you can pull-up and chuck out a bag of garden rubbish). But, as far as can be told, as a true native wild flower Narcissus pseudonarcissus subsp. pseudonarcissus has a scattered but very definite distribution in Britain, with concentrations in, for example, the Lake District and around the Severn and Wye Valleys. Within its native range there have been some declines (an apparent loss from around 15% of the historical range), but nothing startling. In the UK as a whole and in England its conservation status is ‘Least Concern’. On the contrary, in some areas it is common (e.g. 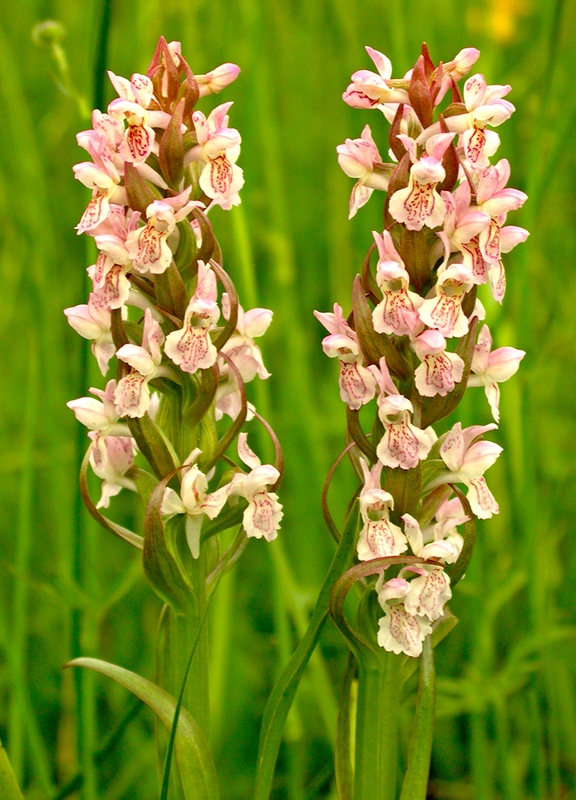 in Gloucestershire – see the photo – in Worcestershire, where the new Flora states that ‘long-known native populations are locally common in the west’, and in Bedfordshire, where the 2011 Flora states that ‘the native populations are still present and, in fact, are reasonably healthy’). The Garden refers to Plantlife (the wild plant conservation charity) for its assessment of the status of wild daffodil, and that’s a story in itself, but the fact is that the RHS are talking nonsense. RHS members are getting the ‘feelgood headline’, but this initiative seems to be more about gardening and less about conservation, and certainly not much to do with the facts. The concept of ’re-wilding’ has become rather fashionable in British conservation circles. And, on the face of it, it is easy to see why – most of the British Isles is anything but ‘wild’, and much of the wildlife that remains is threatened on all sides. Why not let nature take it’s course and get some wildlife back? I have not studied the subject extensively, but I have read George Monbiot’s book Feral, and I must confess to being a rewilding sceptic for a couple of reasons. Firstly, because we don’t really know what ‘wild’ is (or rather was) in Britain or even Europe. Nobody can agree what Britain looked like before farming began to have really obvious impacts on the environment around 5,000 BC. Was most of the land covered in ‘wildwood’, or did fires, floods and large herbivores create extensive areas that were not permanently wooded? Furthermore, farming arrived here just 7,000 years ago, a drop in the ocean in the lifetime of many species of plants and animals, which evolve over hundreds of thousands to a couple of million years. To understand what the environment was like for most of the lifetime of these species we have to go way, way back, before the last Ice Age and perhaps even before the arrival of humans in Europe. We probably have to figure not just beavers, wolves and bears into the equation, but also mammoths, elephants, rhinos, and hippos, if we want to understand what sort of ‘wild’ environment many species of plant and animal need to thrive . Truly ’wild’ might be a lot wilder than we would be comfortable with. Defining what we mean by ’wild’ is an important question because it rather defines what the target of any ‘re-wilding’ project would be. It is a question that has intrigued biologists for a long time, because a large proportion of the native flora and fauna of Britain are not well-adapted to closed-canopy forest, and if the land was covered in trees, allowing a squirrel to go from coast to coast without touching the ground, where did all our sun-loving birds, bees, butterflies and plants live? I worry that ‘re-wilding’ may replace habitats such as heaths, fens, bogs and brownfield sites which are clearly man-made but also rich in a very diverse range of wildlife, with closed canopy forest that is just as ‘artificial’ because it lacks all the big, scary but extinct animals that knocked down trees, made clearings and generally shook things up a bit. I worry that the resultant forests would be a lot poorer in species than the habitats they replaced: not ‘Greenwood the Great’, rather ‘Mirkwood’. Secondly, I am concerned because there is no real agreement about what ‘rewilding’ is; on the one hand there seem to be purists who want fully-functioning ecosystems with a full complement of top predators and no human management at all. Others will settle for some human intervention, and use domestic animals such as cattle or ponies. Thirdly, I have the impression that many of the champions of ‘re-wilding’ do not have a broad knowledge of natural history. They are interested in Wolves and Aurochs, and in remarkable trees, rather than lowly creatures, or in grasses and sedges. ‘Out of sight, out of mind’ and it would be all too easy for species such as Fen Orchid to slip into oblivion. (In fact, ‘re-wilding’ all seems a bit macho: harking back to an imagined time when man vs. wilderness.) Fourthly, it is simply impractical in most of Britain. I worry that a focus on Wolves and Beavers will take energy and resources away from goals that are attainable. Here in Norfolk there is no chance that thousands of hectares will be set aside to ‘re-wild’, no chance that top predators will be introduced. There is, however, a good chance that wildlife-rich heaths, fens and meadows can be managed more sympathetically and effectively using grazing and other forms of traditional human management, and that better connections between these scattered habitats (wildlife corridors) could be developed. This brings me to Natural Surroundings and the Glaven Valley. There is good evidence that the valley has been intensively used by people for a long time (e.g. there a lots of ‘pot boilers’ in the valley, piles of fire-shattered stones dating from the early Bronze Age). At the time of the Domesday Book the valley had 19 watermills. And, all along the lower valley there are meadows, including here at Natural Surroundings. A meadow is an area of permanent grassland that produces hay – once vital to keep livestock alive over the winter. The meadow would be protected from grazing animals in the first part of the year before being cut in mid summer. Once the crop of hay had been taken off it could be grazed by livestock for the rest of the season. (There was no such thing as a ‘wildflower meadow’ – the farmer was interested in hay, not pretty flowers and pollinators, but over time a wide variety of colourful wild flowers would arrive.) Hay-making probably died out in the valley a generation or more ago, but cattle continued to be put out onto the valley’s grassland until recently. Now, large areas have been abandoned and left to ‘nature’. I can think of grassy places in Hempstead, Edgefield, Hunworth, Thornage and here at Bayfield that are crying out for management (= human interference). I do not want them to ‘re-wild’, but that what’s happening. Without cutting or grazing the grassland is so rank and dense that a lot of the smaller and more delicate plants cannot survive, and soon it will turn into thickets of willows and poplars. These are good for lots of creatures, but as meadows and wet grasslands everywhere are either ‘improved’ or abandoned, unimproved wet meadows have become a really rare habitat, much rarer than willow scrub. Luckily, at Natural Surroundings we can do something. We are in the process of cutting our few acres of wet meadow, some of which is very, very rank, and I am really excited. What will happen next summer, and the summer after that? Will we see an improved diversity of plants. Will some of the specialist meadow plants re-appear? Will we still have our Barn Owls (not, as far as I am aware, known to be woodland creatures)? Our meadows are not ‘wild’, but we hope that they will be full of wildlife. 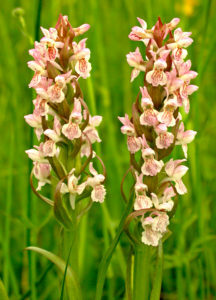 Early Marsh Orchid, one of the specialist plants of wet meadows that we hope will return to Natural Surroundings. This entry was posted in Meadows and tagged Feral, meadows, rewilding on 02/12/2016 by wildflowers.